If you’ve got a passion for authentic kebabs and gyros, you’ll love our Greek street food van which has all the delicious Greek classics you could ever hope for. Serving weddings, parties and company events, our Souvlaki Greek street food van is heading up and down the country to provide top notch Greek mobile catering at a wide variety of special occasions. Our Greek street food van can offer rich, tender lamb, beef or chicken gyros, which are simply fantastic when generously served up in a large wrap with plenty of fresh salad and lashings of sauce. All of our kebabs can be served with fresh, hot fries to ensure your street food cravings are totally satisfied. If you’d rather go with something a little healthier, we can knock up a large Greek salad with your choice of lamb or beef gyro, grilled chick kebab or falafel. Our salads consist of fresh tomatoes, cucumber, green pepper and red onion for plenty of crunch, black olives for that rich Mediterranean flavour, and of course plenty of tangy feta cheese to really make it taste of Greece! As experts in event catering, we knew we couldn’t offer Greek mobile catering without some epic platters on our menu, too. Served with your choice of a small Greek salad, fries or rice pilaf, our plated meals can consist of lamb or beef gyro, grilled chicken kebab or delicious falafel, and they never fail to go down very well with hungry diners. If that wasn’t enough to satisfy you, you can come back for dessert, too! We’ve got gorgeous traditional Baklava which is devilishly sweet and sticky, perfect for those with a really sweet tooth. If you’d rather have something more comforting, our thick, creamy and utterly addictive Greek rice pudding, topped off with a sprinkle of cinnamon, will get the taste buds tingling. 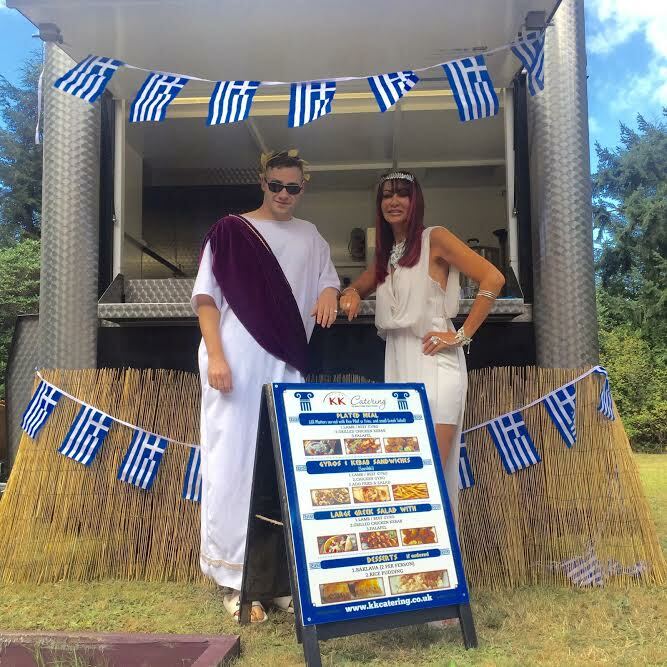 Our Greek Street Food Souvlaki hut catering at a Greek themed fancy dress partyWe can cater to UK events far and wide, so no matter where you’re based we’ll be happy to provide a delectable taste of Greece! Food vans are incredibly popular options for weddings and birthday parties where hosts want to keep things fun and informal. With Greek kebabs, gyros and salads being so popular here in the UK, a Greek street food van is the perfect way to add a unique edge to your event. If you’d like us to provide Greek mobile catering at your event, just complete the form on this page a quote! Thanks! We're creating your quote right now... Where can we send it? Tell us about you're event and we will send you a quote.